In an effort to stay abreast of trends in the social media landscape, I enrolled in the Marketing via New Media course through UCSD Extension which is taught byBecky Carroll, author of the CustomersRock.net. The objective of the online course is to “examine interactive marketing opportunities beyond websites, including blogs, vlogs (video blogs), forums, e-mail campaigns, social networking, communities, podcasts, mobile computing, and even virtual reality.” For individuals whose day to day activities are usually fast-paced, this is a great way to learn and embrace the new marketing opportunities within social media on their own time. 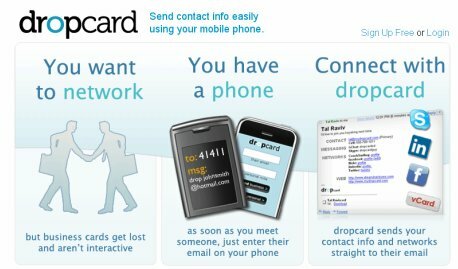 I first heard of the new media marketing course in 2008 when the company I was working for at the time, Brickfish®, was invited by Becky Carroll and her students to speak. 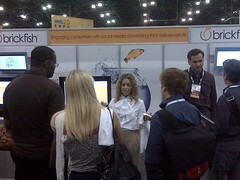 We presented what Brickfish was and how companies could use our platform to launch a social media advertising campaign. In fact, I blogged about my first encounter with Becky’s class which you can view here: Marketing via New Media Meets Brickfish. Since 2008, I’ve always wanted to enroll but there was always an obstacle (i.e. work life balance, other extracurricular commitments, etc.) that prevented me from doing so. Now that I’ve finally enrolled in the class and I’m definitely looking forward to what the course has to offer as well as meeting other students in the class that are as passionate about social media as I am. I’ll keep you posted on how it goes. Thanks to the Twitter Photoshop template available at Boinblog, personalizing your Twitter profile to promote your personal brand just got easier. Most tweeps upload a background for their Twitter profile while others take it a step further, like Problogger, and include links to their other social media profiles. Inspired by Problogger, Boinblog’s easy to use template, and armed with a copy of Adobe Photoshop, I took the leap and updated my Twitter profile. You can follow me at @HeyStephanie. 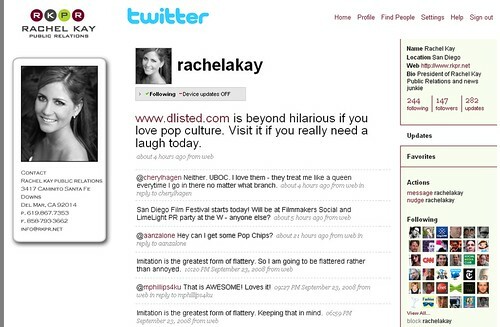 Rachel Kay is the founder of RKPR and is an award-winning public relations expert. Check our her new site when you get a chance. 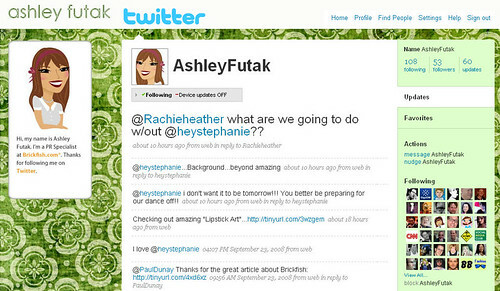 Ashley Futak who is a part of the Brickfish public relations team and just recently came back from the Web 2.0 Expo in New York (stay tuned for her guest post on Wednesday, October 1, 2008), also let me update her Twitter background. For her avatar I went to PosePrints then used my digital scrapbooking elements from Keri Schueller’s Organica collection. 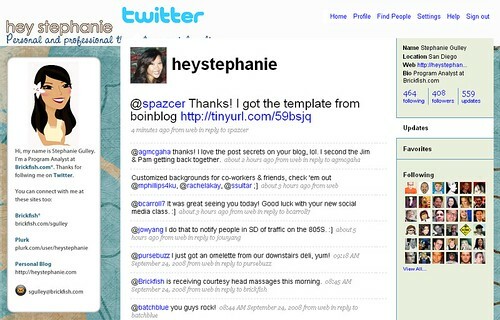 To view other Twitter backgrounds that I helped co-workers with, check out @mphillips4ku and @ssultar. Have fun with your backgrounds and feel free to leave your Twitter link here so we can check them out. This has to be my favorite Brickfish campaign simply because it’s easy to enter and the prizes are fantastic! Who doesn’t want a $500 gas card? Grand Prize: One winner, selected from the top 100 highest scoring entries by Brickfish, will win a $500 gas card. 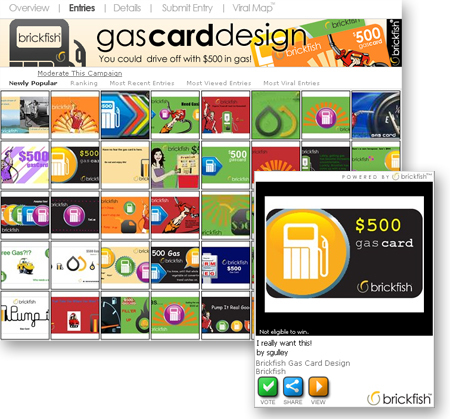 Most Viral: One winner, selected by Brickfish from the top 10 Most Viral entries, will win a $250 gas card. Learn about Most Viral. Weekly Voter/Reviewer Sweepstakes: Each week, one winner who participates in the campaign by voting or reviewing will win a $100 gas card. The campaign just started yesterday and people are already submitting their designs. 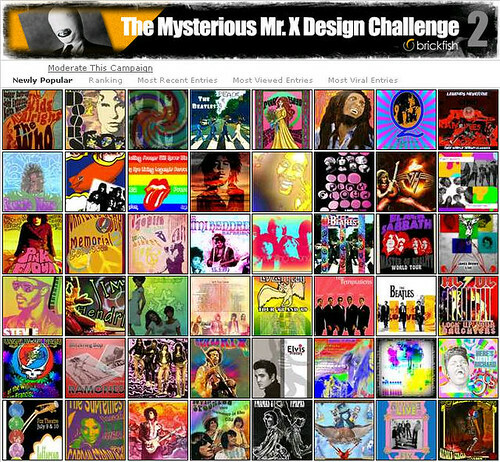 You can check out all of the entries here. So to get you started, I made a quick tutorial on how to submit an entry using the Entry Editor.